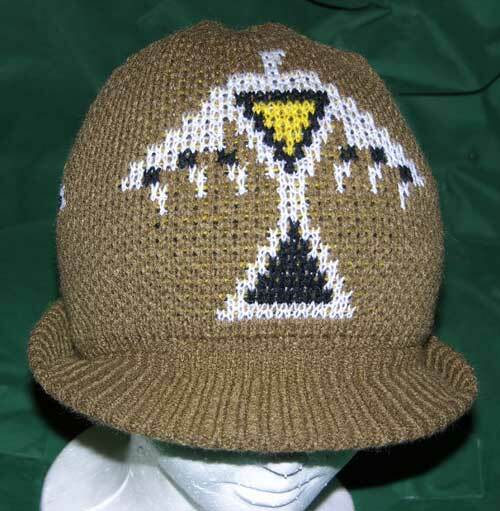 This Unique Knit Visor Cap honors the White Hawk from the Woodland tribes. 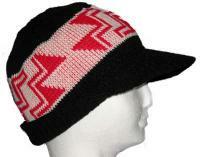 White Hawk is inspired from a Woodlands Indian design. The white hawk is noted for the black band of color on its wings and tail feathers. It has a black beak and yellow legs. 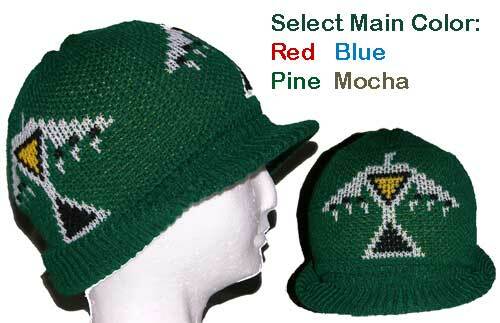 Woodland Indian designs were often beaded as separate design elements. Historic Woodland designs were geometric which often honored the birds and animals. Natitve American Woodland Indian designs are also known for their beautiful floral designs which were introduced from the floral embroidery designs influenced by the needlework taught in Canadian convents by Roman Catholic sisters. Many Indian tribes are referred to as Woodlands. These tribes extended from Central Canada in the North to Texas in the South and Eastward to the Atlantic Ocean. Some reference books further divide them into the Eastern Woodland and the Southeastern Woodland Tribes. Author W. Ben Hunt wrote Indian Crafts and Lore in 1954, published by Golden Press. In this book a map of North American Indian Cultural Areas was shown. Some of the Eastern Woodland Indian tribes were shown as: Swamp Cree, Central Cree, Chippewa, Menomini, Winnebago, Sauk-Fox, Potawatomi, Miami, Ottawa, Huron, Wyandot, Algonkin, Montagnais, Beothuk, Abnaki, Penobscot, Micmac, Mahican, Mohawk, Onedia, Seneca, Erie, Iroquois, Delaware, Conestoga, Susquehanna, Pennacook, Massachuset, Pequot, and Narraganset. Southeastern Woodland tribes were shown as: Kickapoo, Illinois, Quapaw, Cadoo, Chickasaw, Choctaw, Tonkawa, Atakapa, Natchez, Shawnee, Cherokee, Creek, Powhatan, Tuscarora, and Seminole.
. Click on images to see enlargements. Select Visor Depth: 2.5" or 1.5"